A society in which people work only because they have to have money is no better than slavery. 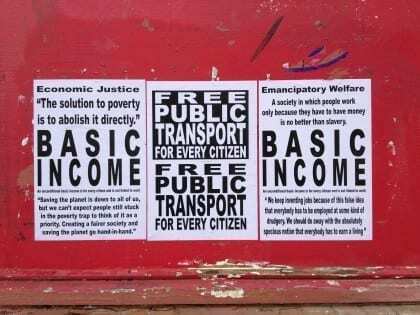 The black-and-white poster carrying this message is one of a large number of basic income sheets which artist-campaigner Russell Shaw Higgs has been pasting all over his part of London, Hackney. Another one argues that if people are intrinsically of value, they have the right to survive without working. Yet another quotes Martin Luther King: “the solution to poverty is to abolish it directly”. The paste-ups contain no web address, no logo, no signature. No call to action, except for some which encourage you to google “Basic Income” for more information. The posters carry just the substantial message, the core argument. They’re a street-art fragment of a conversation in a public space. When Higgs emails me from Athens, where he’s spontaneously absconded, he says he makes no distinction between his personal life, his art and his political activism. Reading his emails makes it clear what he means. Higgs combines a coherence of thought with acts that are as much about self-expression as they are about campaigning. The “profoundly social space” of the streets of Athens is contrasted with London as a metropolis “dominated by corporate advertising, CCTV, Public Order Acts, and the general, ever creeping privatisation of our commons”. Higgs naturally believes that Greeks in particular should be granted Unconditional Basic Income. This is not only because they have been singled out for “a whole special kind of brutal punishment by international bureaucrats and banker racketeers, with undemocratic global corporations hovering in the shadows” but also because “we owe Greece such an immense cultural debt”. Higgs is used to making the case for UBI. Earlier this year, he stood in the UK general election, contesting the parliamentary seat for Hackney South. 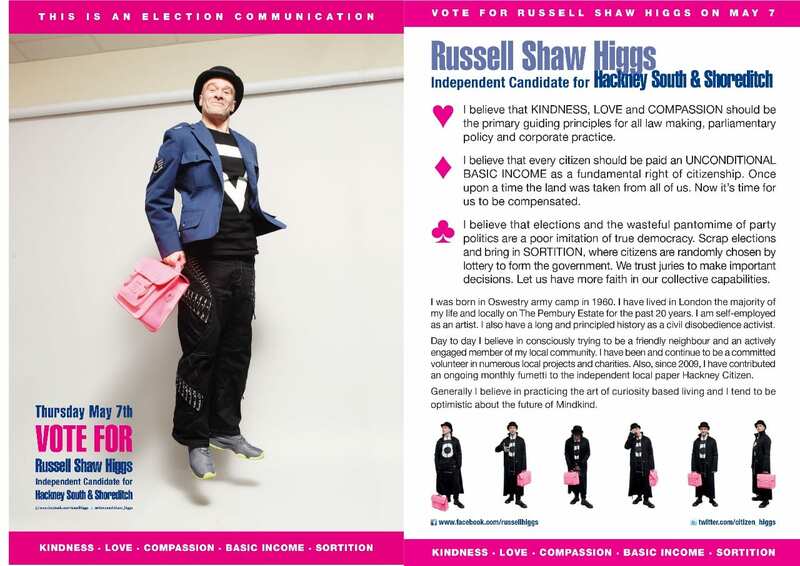 Seeing it primarily as an opportunity to promote ideas, Higgs’ campaign literature found its way to 62,000 households. His main causes were UBI, compassion and sortition: the random lottery selection of political officials, as – partially – practiced in ancient Athenian democracy. Higgs and the Green Party candidate were the two candidates promoting Basic Income and by chance they were always seated alphabetically next to each other at the hustings as they confronted the rigidity of the establishment parties. 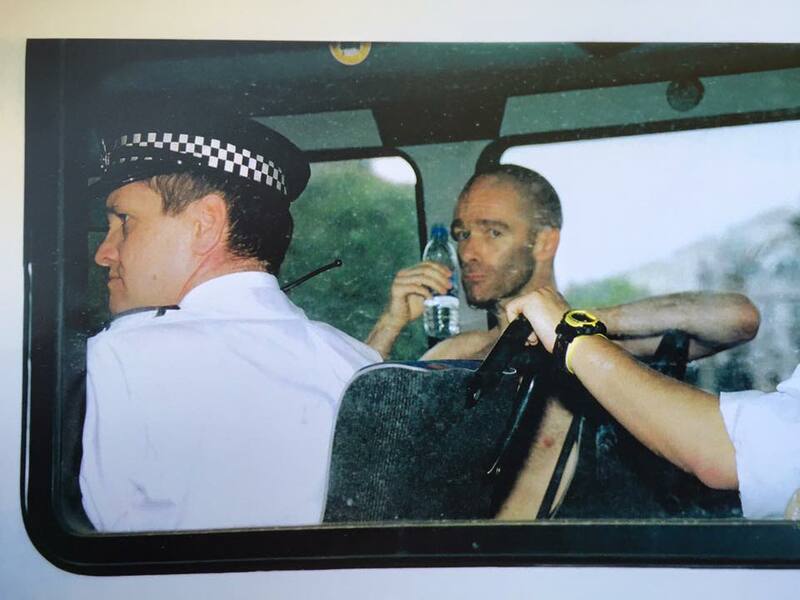 In the winter of 2000-2001 Higgs participated in a number of naked protests, attracting “much coy media and friendly public attention” with a simple yet radical action. Higgs spent a month continuously unclothed: he was remanded naked in his segregation cell in Brixton Prison, he also appeared naked in court in front of the judge and jury, until ultimately being found not guilty of any misconduct. A year later Higgs got himself his first iMac and home internet connection. He became an intensive blogger and soon discovered Basic Income. Like many UBI supporters, the fundamental liberation for Higgs would be to “uncouple work from money once and for all” and to begin valuing human lives, not humans as slaves. “I find it appalling that most people’s lives are fundamentally dominated by (wage) slavery and the corrupt propaganda, from cradle to grave, that results in people colluding in their own slavery, backed up by the false notion that it is all about ‘morality’”. Higgs says that growing support on the left as well as the right gives him hope. He says people are crying out for new ideas and solutions and that many can see that the old ways of organising society are desperately in need of being revised. The challenge is overcoming apathy and the “accumulative drip-drip poison and negativity propagated daily by mainstream media and so called ‘leaders’”. To read the entire Q&A click here. To view a collection of Russell Shaw Higgs’ UBI work on Flickr click here. Will Wachtmeister, “Being human: Q&A with the artist behind the London UBI posters” Personal interview, September 26, 2015. 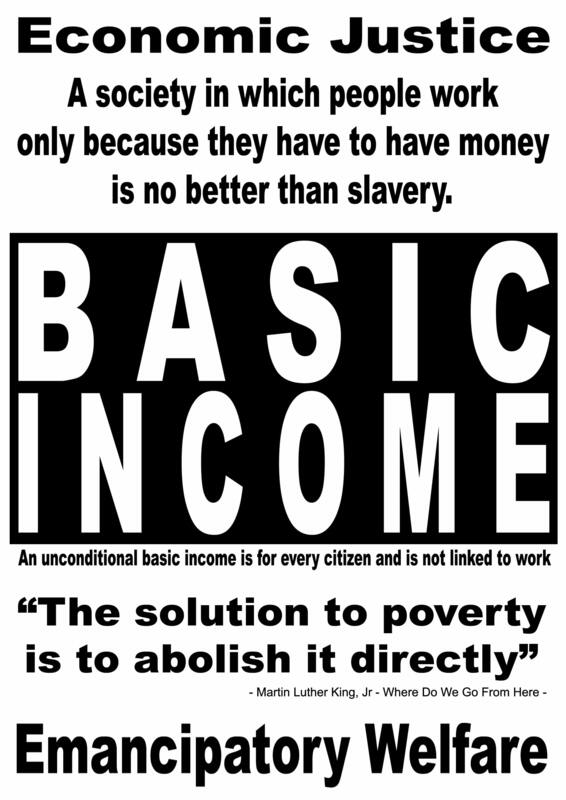 For basic income network http://www.GRB.net.